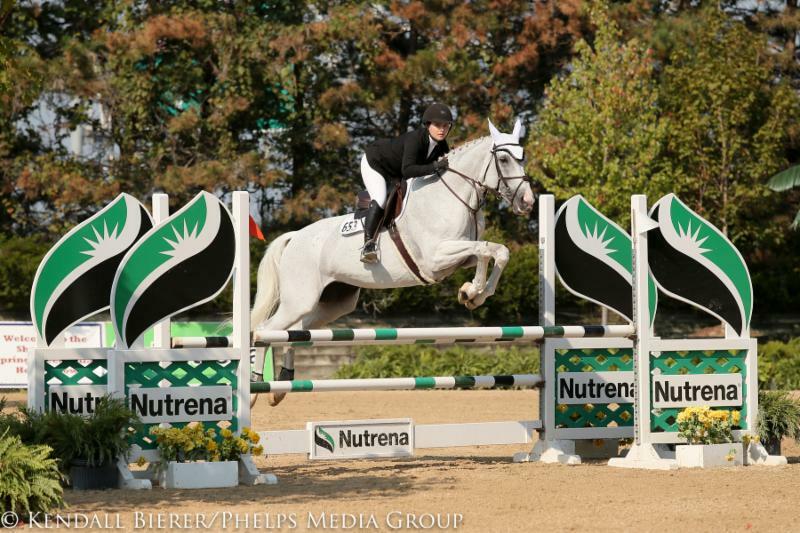 The $5,000 USHJA North Regional Children's Individual Jumper Championships concluded Sunday, Sept. 6, 2015, during the Showplace Jumper Spectacular. Kesley Taylor won the gold medal, Noa Leibson was awarded the silver and Madeline DeRose captured the bronze. Roscoe, Illinois - Sept. 6, 2015 - Three days of fierce competition led up to the crowning moment of the 2015 USHJA Children's & Adult Amateur North Regional Championships, with the final phase of the $5,000 USHJA North Regional Children's & Adult Amateur Individual Jumper Championship. Twenty of the best horse and rider combinations from Zones 1, 2 and 5 gathered at Ledges Sport Horses for the culminating event, yet it was hometown child rider Kesley Taylor, 17, who sealed the victory with her fourth clear effort of the three-day event aboard Zelda, and Lisa Baker later mirrored the victory with Zyminka to take the Individual Adult Amateur Jumper Championship. 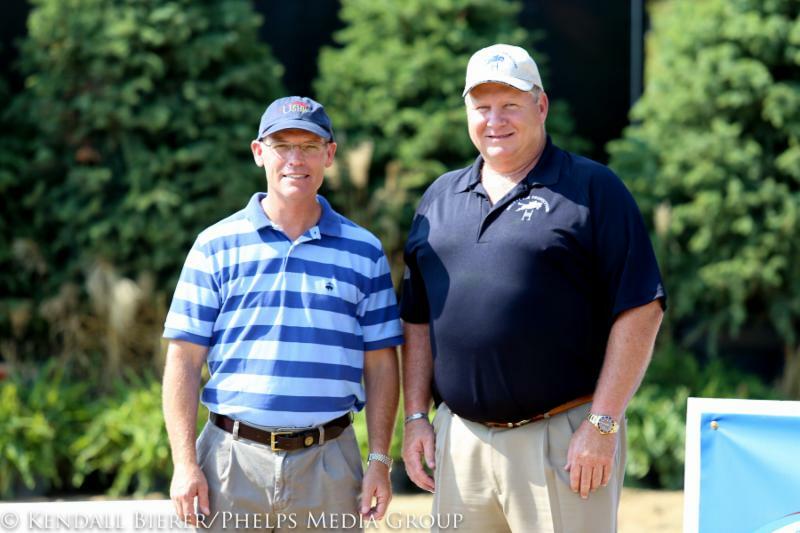 USHJA President Billy Moroney said, "I think Pat [Boyle] and his whole entire team did a wonderful job of making this really special for all of the participants. I think that the crowd support was really exciting, and the idea of the barn challenge brought a lot of people out. It was really nice to see the entire VIP area and the stands packed with people, and it really had a special championship feel to it. I think that all of the riders and participants were thrilled with it, I know that we at the USHJA are thrilled." Kesley Taylor had the weight of the world on her shoulders as she watched each rider tackle Anderson Lima's track. When it came down to the final four, the heat kicked up a notch as the lead continued to change hands. Madeline DeRose of Ann Arbor, Michigan, was in the final four to return. She executed a nearly flawless round aboard Aaron Vale's Chawa, balancing neatly for the verticals, thinking through the turns and opting for the steady six down the final line. She landed from the final oxer with a clear round, accruing no additional penalties to end with 2.5 points. With three of the top riders remaining from Saturday's Gold and Silver Teams, DeRose knew that she was teetering on the border line of medaling. "I have only been riding Chawa for a month, so it is a new partnership for us," the 16-year-old rider explained. "He likes to go, and he can get a little strong sometimes. You have to balance him and make sure that he doesn't have the rail. I have never had an experience like that before, standing on top of the podium and wearing a medal. This is definitely biggest win to date." Trainer Camille Maynard added, "I am just very proud of Maddie. She has come a long way. She thought at every jump out there today and she was never a passenger; she did it 100 percent today." Noa Leibson of Highland Park, Illinois, was the next to return. She carried only 2 points over from the previous two days of competition, and knew that there was no room for error on course. Trainer Lisa Goldman stood ringside, jumping right alongside Leibson and Blackhawk as they navigated the track. "Blackhawk, or Choco, is wild, but he listens like I have never had a horse do before," Leibson smiled. "Everything I ask of him he does. He loves his job and all he wants to do is jump more jumps. All I have to do is point him in the right direction and he does it for me. The course was very technical, it had a lot of lines, but Choco is always right there for it." When Leibson landed from the final fence, she knew that she was guaranteed a spot on the podium, adding no points to her previous total of 2. Isabella Roman was right behind her as the penultimate rider of the class; however, a rail at the final oxer would knock them from the medals and into the eventual fifth place. Leibson said, "I hoped that I would make it into the medals. When Isabella had the rail, I could not believe that I had definitely earned silver. Kesley is so good, so I knew that I would be happy with second." Leibson continued, "It is so hard to do this sport. It takes a lot of money, and it is very expensive. This year was never really supposed to happen, for that reason. I got this chance because of my dad, and I thank him so much for it. Now it is going to be harder to show, but because Choco gave me everything in there, it made it all worth it. It was a once in a lifetime chance for me, and to take second place, meant the world." Taylor entered the ring as the final rider of the class. She was the only rider to enter with zero penalties to her name, but one rail could knock her from the pinnacle of the ranks. She zeroed in on the fences, took a breath and tuned out the rest of the world as she focused and followed her plan. Taylor and Zelda delivered and rode to the championship win. She said, "When I started off I was very nervous. Normally after the first jump I just phase everything out, but hearing the announcer in the background was not helping today. I may have looked calm, but I was very nervous." Taylor and Zelda had a hard rub at the first jump of the track, yet it stayed in the cups. She admitted that she thought that they had it down, but when the audience stayed silent, she let the tension melt away and continued through the 12-obstacle course. Down the final line, trainer Tina Judge had said that if the distance for the five was there, then they should take it. Judge said, "I was standing alongside the final line, and I saw her distance when she landed from the CWD-oxer. I knew that if she pulled too hard she would risk the possibility of having the last rail. The horse was jumping great and smooth. Zelda has such a big stride that it is easier to go for it, and she did! I am so proud of her." Taylor commented, "When we landed from the final oxer, I almost started crying, because she was so good! I went for the five in the final line, because Tina [Judge] told me I could. I went for it, and I was so happy with it. The distance was perfect-It was right there." The 17-year-old from Naperville, Ill., has only been showing in the jumpers for one year, and her win Sunday earns her the coveted invitation to the prestigious Emerging Athletes Program (EAP), an opportunity that Taylor has been hoping to take. "I am really excited to be able to attend the EAP next year," Taylor commented. "I think that it will be a great opportunity, and Tina and I think that I will be able to take a lot away from it. It's crazy to think that only a year ago I was competing in the 3-foot hunters with my horse, but I don't think that I can ever go back. I love doing the jumpers, and I love the team that has supported me. I could not have done this without the help of great trainers, a wonderful horse, a great dentist, farrier, dad, parents, grandparents, and our groom, Juan. He is so meticulous, and he truly cares. It is a great team effort." $5,000 USHJA North Regional Adult Amateur Individual Championships: Gold medal winner Lisa Baker, silver medalist Jenny Swanson and bronze medalist Jean McLaren. Although the lead changed several times during the $5,000 USHJA North Regional Children's Individual Jumper Championship, the top three stayed consistent in its Adult Amateur counterpart. It was Lisa Baker who turned in her fourth clear effort of the championship with Zyminka, owned by Triple Bar LLC of Angola, Indiana, standing atop the podium as the gold medalist at the conclusion. "I was really nervous, especially going last, and seeing the riders before me who had a great ride," Baker said. "I thought it was great, and hard. Consistency is not my strength. I knew that I could not wake up tomorrow, and think 'OK, you did good yesterday.' It's hard for me because my mare did so nicely and I could not take anything for granted." Polly Howard-Coberley and Meg Howard-Fuleky of Fox Meadow Farm, located in Temperance, Michigan, have trained Baker, working patiently with her to remove the 'bad habits' she came to them with 8 years prior. "It is hard for me, I don't learn easy, and my trainers have worked really hard for me. It feels like I am stepping in the direction they want. Sometimes it has been going backwards in order to go further. When I came to Fox Meadow Farm eight years ago I had some rough ideas, and I asked for a makeover, and that is what they gave me." "It was really hard to go in with so much pressure without losing my head," Baker admitted. "I just treated it as if it was my first time in the ring. You hear the things your trainer tells you, and you have to put them into action. I felt prepared, and it was a great feeling to accomplish it." Jenny Swanson and Vendicat, owned by Christina Fried of New York, New York, stood aside Baker on the podium in the silver medal position. They finished with a total of 1 penalty, clearing the final course of the day and maintaining their position on the leader board. "I thought the course was really good today. I liked feeling the pressure," Swanson said. "At the end of the day it feels really good to push yourself and ride well. I liked the format a lot. I didn't realize how important it was to do really well on the first day, it affects the whole three days. It is really great for us to learn how to stay consistent, and work on consistency at this height." The bronze medal was awarded to Jean McLaren of Chicago, Ill., who has stood on the podium for two consecutive days. Yesterday McLaren was part of the Zone 5 Gold Medal Team with teammate Baker, and her appreciation for the format was reflected her final sentiments upon her third place finish. "My mare was really tired today," McLaren laughed. "We had a few really hard rubs, so this was a day when luck was on our side. She was great though, she tried her heart out. It was a really fun event, and I really enjoyed it." McLaren concluded, "I have a fast horse, so I should have learned to be clean first, and then fast. I have never ridden on a team, aside from Pony Club, when I was 11. It was really nice to meet everyone and be a part of something bigger than yourself." Showplace Productions will shift to Lamplight Equestrian Center located in Wayne, Ill., for the popular Showplace Fall Classic from September 8-13. The Fall Classic will feature the IHJA Medal Finals and the $30,000 Showplace Grand Prix along with the Marshall & Sterling Midwest Finals and the USEF Zone 5 Horse of the Year Finals.